Learning takes place in the club environment. Club meetings are workshops where you study and practice communication and leadership skills with others also keen to learn. Members learn by studying the manuals, practicing and helping each other. You learn by doing and by watching other club members. On joining, you will be given two manuals – Competent Communication and Competent Leadership. The Competent Communication manual has 10 speech projects, each designed to improve your speaking skills. The projects are designed to develop your ability to present speeches in a systematic way at a pace to suit your own needs. After qualifying as a Competent Communicator, you can develop your skills further by working through a series of “Advanced” manuals to become an Advanced Communicator. 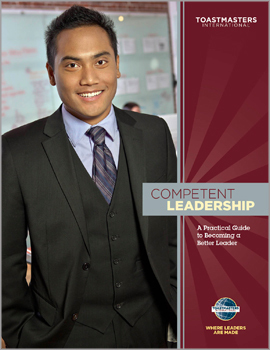 The Competent Leader manual has 10 projects, each designed to improve your leadership skills by serving in various Toastmasters meeting roles. Other areas of leadership are club officer roles and educationals found in the “Leadership Excellence Series”. After qualifying as a Competent Leader. you work through a series of “Advanced” manuals to become an Advanced Leader. The ultimate goal is to become a Distinguished Toastmaster (DTM). Clubs are part of Areas. Areas are part of Divisions. Divisions are part of District. Districts are part of Regions. Regions are part of Toastmasters International. Johannesburg Toastmasters Club is in District 74. District 74 is in Region 11. Venue: Johannian Club, St Johns Road, Upper Houghton. In grounds of St John's College.